Pelenna Patchworks: A Walk In The Glen fabric from Lewis & Irene, now available at Pelenna Patchworks! A Walk In The Glen fabric from Lewis & Irene, now available at Pelenna Patchworks! If you're a dog lover, or you love the countryside, (or you love Scotland!) 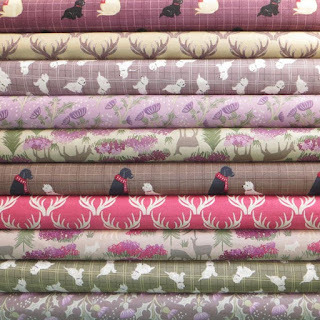 then the new A Walk In The Glen fabric range from Lewis & Irene should be right up your street! Featuring a stunning thistle design, doggy friends and antler motifs, this range is as classy as they come! Available as a stash pack also, or a fat quarter pack that gives you a 5% discount over buying the fabrics separately.